to allow more time to apply. is the nation's most comprehensive series of contests in the classical arts. designed to evaluate, recognize and reward the best performers, ensembles and composers in the United States based on submitted recordings. There is no live competition. The American Prize has attracted hundreds of qualified contestants from all fifty states since its founding, has awarded more than $60,000 in prizes in all categories since 2010, and is presented annually in many areas of the performing arts. To start, click on "Competitions" in the menu bar, above, to see the range of contests The American Prize sponsors each year. Semi-finalists and finalists for 2018-19 are being published. Please click on "news" (above) for details. ALL contests have now been UPDATED for 2019-20. Email to be placed on our list to receive further information. Results may be found by visiting The American Prize blog. Use the navigation tool in the right hand column to find the contest in which you have interest. in the performing arts since 2010. * The American Prize evaluates recorded performances only (online or on disc). * There is no live competition. * Separate categories based on age or education. * Cash prizes to winners. * Written evaluations to those who rank finalist or higher. 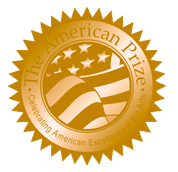 The American Prize has awarded more than $50,000 in prizes in all categories since 2010.
in which you have interest. Metropolitan Opera mezzo-soprano, SUSANNE MENTZER, has joined its distinguished panel of judges. Click "judges" to read her biography. Metropolitan Opera dramatic soprano, SHARON SWEET, to its distinguished panel of judges. Click "judges" to read her biography. NOW—you have the option to pay application fees online—or by check, credit card or money order. NOW—you have the option to provide online links to your audition selections, or send recordings by mail. NOW—you have the option to fill out the application on your computer and email it directly to the office—or print out, fill by hand and send by mail. providing cash awards, professional adjudication and regional, national and international recognition. at the professional, community/amateur, college, university, church and school levels. You probably record your performances already. receive the accolades you or your ensemble has earned. and by community and professional musicians, actors and composers. to the quality of life in the communities they serve. It is time their work was recognized. That is the reason for The American Prize..."